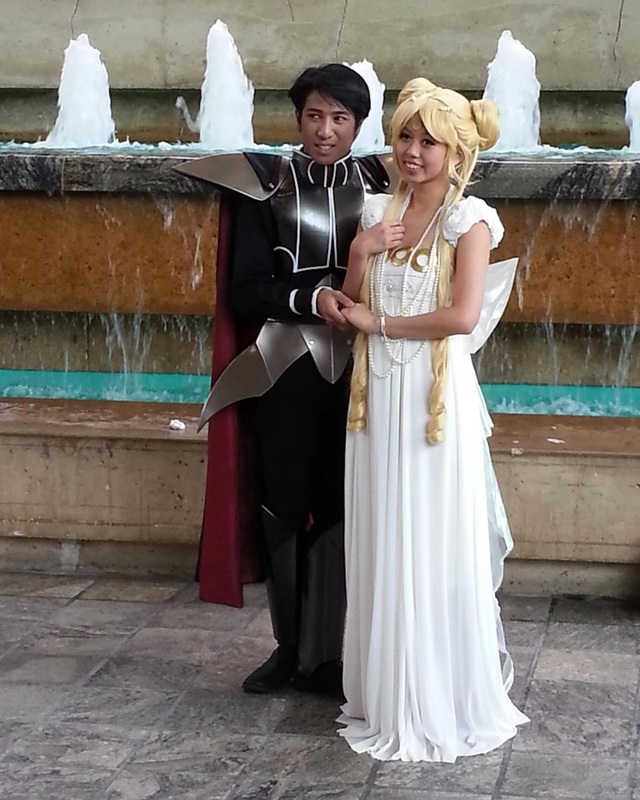 I made a Princess Serenity costume this year for Otakon. This post will focus on how I made the gold circles on her dress. Coming soon is Part 2 for her draping back bow. Part 3 will give some tips on how I approached the shoulder decorations. Wig was bought from Ebay and dress was made from a light chiffon type material. There are many ways to make this, but I decided on fabric wrapped foam circles. I bought a stretchy type fabric in a shiny gold color from Walmart. It is helpful that it is stretchy because it can wrap around easier and does not fray! very important for a cleaner look! First, I looked for a large circle and a smaller circle to trace out an approximate template of the rings. Trace the template on the back of the fabric. Wrapping fabric around a circular shape can come out looking funny and bumpy. To achieve a smooth and messy-free circle, I cut the outer ends in a diagonal parallelogram shape and the inside ends in a trapezoid shape. You will have to look at the picture below to get a better idea of what I mean. Here is how I cut out the middle. Make several trapezoid tabs. Place your foam circle over the fabric and use E6000 glue to glue down the tabs in the middle. You may need to do it one by one and hold until dry. This is how the outer diagonal tabs should look after it is cut out. Same as the inside, start gluing down the tabs, they should be overlapping each other. This is how the front should look. Notice how smooth the edge is. It is pulled under tight enough that the side view looks smooth too. This is the completed look in the back after you are done gluing. And finally, here is the final product. A perfect gold fabric circle. It was very time consuming, and I had to make 11 of these! But I think it gives it a great look and it is easy to do. I sewed the circles onto the top of the dress. It can get difficult because you will need to sew 2 connecting gold circles so they don't stretch far apart, and also account for the stretch of the dress because you might sew it too tight and loose the stretch of the dress. So just make sure to pull as you go and make sure your stitches are not making the dress too constricting. You could also try gluing it onto the dress, but I'm not sure how that will work out. Wow, what a great idea! =) So simple after you lay it out like that! super creative! What did u use for fabric I know you said chiffon but chiffon is see through what other fabric did you use? It wasn't as flowy or long as I'd hope, so I bought additional white chiffon fabric and made a long skirt and sewed it On Top of the base, from the waist down. The original dress had 1 layer of regular not see though fabric, with chiffon on top. Along with my layer of chiffon, it was not see through anymore. I wore leggings underneath when I wore it in case too. If you are able to make an empire shaped dress from scratch, i would suggest that. Using any type of flowy regular fabric underneath as a base and another layer or 2 of chiffon, if you prefer this style like me. Some people have used satin for their dress, if you want something stiffer and shinier. The foam the used for these gold rings? Its craft foam sheets, you can buy them at crafts store. I got mine at Michael's. What gold fabric did you use to make the circles? You mentioned that it was a stretchy material but what exactly? I'm not sure what kind it is, don't remember the tag, I just found it at my walmart store, and it was a good metallic gold. the bottom side is a different color, the gold is a top layer. Most importantly, I would just recommend using a fabric that doesn't Fray at the ends where you cut it. So that the circles come out neat and clean. How big did you make the circles? The circle is 2.75" inches and the center circle is 1"